The Church of St Mary dates back to at least 1295, but it was mostly rebuilt in 1474. 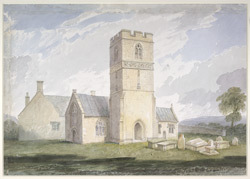 In 1854, a few years after Buckler made this watercolour, the church was yet again modernised. Fortunately, many of the original features were sympathetically restored.